A LEGACY OF AUTHENTIC FLAVOR. Don Bonifacio Gonzalez, a hard working man that came to the states in the 1930s, he was from Guadalajara Jalisco, where he grew up in Sector Reforma, Colonia Analco. Don Bonifacio had a vision to one day open his own Birrieria with the family trade recipe, the secret recipe was given to him by his uncle when he was a young boy. The recipe has been in the family for over 100 years, and in 1972 his dream became reality and opened Birrieria Jalisco in Boyle Heights, California. Through hard work and dedication Don Bonifacio Gonzalez established his business and many relationships, generation after generation with customers that enjoy the delicacy of authentic Birria of Guadalajara Jalisco. Don Bonifacio Gonzalez, passed away in 2000 and his legacy and tradition is kept alive by continuously serving the best Birria, providing great customer service and being interactive in the local community. Today Birrieria Jalisco is located at Plaza Mexico in Lynwood, California. Please come get your goat it will be a pleasure having you at our restaurant. This is what Don Bonifacio favorite slogan is until today. Jalisco wich means "Over the Sand" (Sobre la Arena) is one of the 31 states which, with the Federal District, comprise the 32 Federal Entities of Mexico. It is located in Western Mexico and divided in 125 municipalities, and its capital city is Guadalajara. Jalisco is one of the more important states in Mexico because of its natural resources as well as its history. Many of the characteristic traits of Mexican culture, particularly outside Mexico, are originally from Jalisco, such as mariachi, ranchera music, tequila, jaripeo, etc. Economically, it is ranked third in the country, with industries centered in the Guadalajara metropolitan area, the second largest metropolitan area in Mexico. The state is home to two significant indigenous populations, the Huichols and the Nahuas. There is also a significant foreign population, mostly retirees from the United States and Canada, living in the Lake Chapala and Puerto Vallarta areas. Classic dishes for the area include local versions of pozole, sopitos, menudo, birria, pollo a la valenciana and tortas ahogadas. 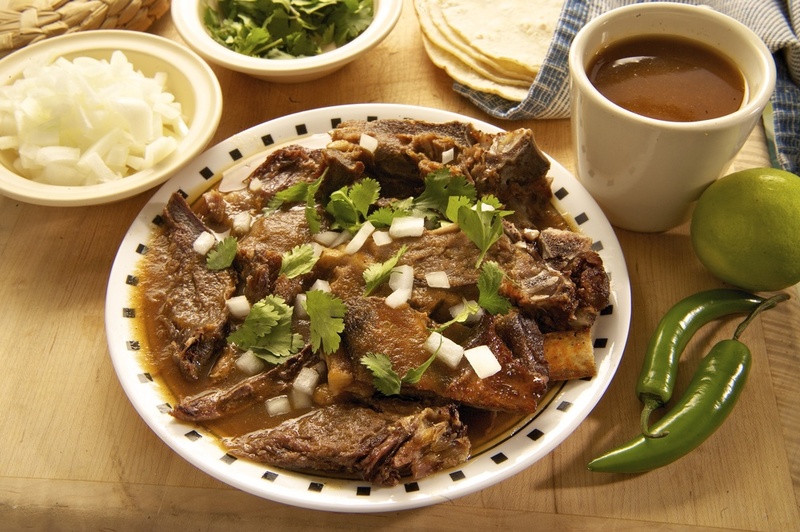 Birria is a meat stew made with roasted chili peppers, spices and with either goat, mutton or beef. Tortas ahorgadas are pork sandwiches on French rolls which are covered in a tomato and chili pepper sauce. Common street foods include sopes, tacos, enchiladas tapitíos. Tapalpa is known for its Borrego al pastor (grilled mutton); Cocul and Ciudad Guzmán are known for birria; the Lake Chapala area is known for a dish called charales and Guadalajara is known for tortas ahogadas. Sweets include alfajor, squash seeds with honey, coconut candies, buñuelos and fruits conserved in syrup. Drinks include tequila, aquamiel, pulque, tepache, tejuino and fruit drinks. Tepache is a drink made with pineapple. Tuba is made in Autlán de Navarro. Rompope is made in Sayula and Tapalpa and tejuino is most common in the center of the state. Along the coast, seafood is prominent. Some popular seafood preparations include shrimp breaded with coconut, and rollo del mar, which is a fish fillet stuffed with chopped shrimp and octopus, rolled and sometimes wrapped in bacon and covered in either a chili pepper or almond sauce. Puerto Vallarta has become a gourmet dining attraction as the site of the Mexican Gastronomy Fair held each November. It was a fishing village before a tourist destination and simple grilled fish dish called pescado zarandeado is still popular.